TACLOBAN CITY – Victims of last year's Typhoon Yolanda today assailed Department of Social Welfare and Development Sec. Corazon “Dinky” Soliman for bragging over a US$6-million dollar aid from the United Nations Children's Fund (UNICEF) and including it in the Aquino government's dole-out scheme. Sister Eslopor expressed outrage that the DSWD should be relying on the goodness of others for doing the government's responsibility, especially what it should have done immediately after the typhoon hit last Nov. 8. “We thank the UNICEF for the humanitarian assistance. But the Aquino government should have rendered emergency cash assistance and other kinds of relief three months ago, not today. That is sheer criminal negligence. Does Dinky Soliman realize how many of the so-called most vulnerable – including pregnant women and malnourished children – have suffered for the past months, and may have died, because the government balked at releasing funds for the people while it was at the same time embroiled in the pork barrel scandal? For the past three months, the DSWD has not been carrying out any significant social amelioration program but has merely acted as the facilitator for foreign and local donors. The People Surge spokesperson asserted that the Aquino government must render all possible emergency assistance, while planning for long-term solutions for the people's losses and grinding poverty. 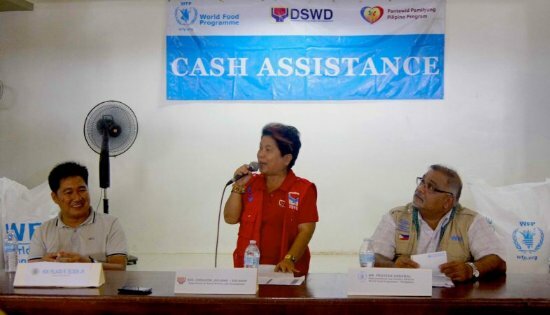 “The conditional cash transfer scheme or 4Ps to which Dinky Soliman and the DSWD are so devoted is nothing but a dole-out program. The people cannot survive for long on mendicancy. CATBALOGAN CITY, Samar – One NPA regular member and three NPA Unit Militia members operating in Northern Samar surrendered to the 34th Infantry (Reliable) Battalion on February 7 and February 8, 2014 respectively. Based on the report provided by 34IB, a certain aka Macky/Baba, a regular NPA member surrendered to 34IB bringing along with him a .22 Caliber pistol. According to aka Macky/Baba, he surrendered due to the hardship and difficulties he had experienced inside the rebel movement. On the other hand, the Commanding Officer of NPA Unit Militia based at Brgy Malidon and two of its members voluntarily surrendered to 34IB upon witnessing the sincerity of the government through the Bayanihan Team Operations of troops under said Battalion in their barangay. Under the Local Social Integration Program of Northern Samar Province, an NPA surrenderee will receive P10,000.00 as immediate assistance and P30,000.00 as livelihood assistance. The surrenderees will be receiving their benefits upon completion of documentation of their surrender. HO CHI MINH CITY, Vietnam – McDonald's Corporation (NYSE: MCD) today announced the opening of its first restaurant in Vietnam, which also marks the 10,000th restaurant for the chain in the Asia, Pacific, Middle East, and Africa region. The opening of the 24-hour Drive-Thru McDonald's restaurant – the first drive-thru restaurant ever in Vietnam -- heralds an entirely new level of dining convenience for customers in Ho Chi Minh City. Strategically located at the busy roundabout at intersection of Dien Bien Phu and Nguyen Binh Khiem Streets in District 1, the two-story standalone restaurant is easily accessible for commuters to purchase a McDonald's meal on the go using the Drive-Thru service. "We're proud to open our 10,000th regional McDonald's restaurant in Vietnam, a country which offers tremendous opportunity to grow our Brand," said Don Thompson, McDonald's President and CEO. "I'm thrilled to be here to celebrate with our local team and welcome our new employees and customers together. Our commitment in this part of the world and everywhere is to deliver a modern and exciting restaurant experience with delicious food and drinks, at the convenience our customers expect from McDonald's." "Our relationship with our Vietnamese partner is strong and firmly rooted in McDonald's values. We look forward to building our brand and our business responsibly, as part of our growth strategy in Asia, and to making a positive impact in the local Vietnamese community," added Dave Hoffmann, President of McDonald's Asia Pacific, Middle East and Africa. McDonald's 350-seat restaurant in the Da Kao ward of District 1 reflects best-in-class design with a full range of amenities and services unique to McDonald's restaurants around the world. With a total floor area more than 1,300 square metres on a property close to 3,000 square metres, the restaurant is designed as a modern dining destination. In addition to Drive-Thru service, customers will enjoy a multitude of offerings around the clock including delicious McDonald's food, free Wifi internet access, family-friendly amenities like a children's Playplace and party rooms, and parking facilities for cars and more than 250 motorbikes. On the menu front, in addition to McDonald's iconic choices such as the Big Mac and world-famous French fries, the first restaurant in Vietnam will launch the McPork line of burgers, which was especially created to reflect local Vietnamese tastes. "Today is a very special day for the entire McDonald's Vietnam team. All of us have been highly inspired by the tremendous support we have received from the global McDonald's team and the rigorous operational training our team has experienced over the past year. We are extremely proud to serve our customers who have long waited for the arrival of McDonald's here," said Henry Nguyen, founder of Good Day Hospitality and developmental licensee of Vietnam. "We want our restaurants to be places within the communities they serve where friends and families can enjoy a special McDonald's experience made memorable by fresh, great-tasting food, fast and friendly service, and a comfortable and welcoming environment. The opening of our first restaurant in Vietnam is just the beginning of a journey with our customers. We will work hard to continually stay relevant to our customers' needs and exceed their expectations," added Nguyen. Does the Philippines have what it takes? MANILA – The countdown to the highly anticipated J Spring Fashion Show on the world’s latest architectural wonder, Gardens by the Bay’s OCBC SKYWAY, on 5 March 2014 in Singapore has officially started. Known for her female-only, history making catwalks, Jessica Minh Anh’s latest VIP-only showcase will feature male models for the very first time. In this rare opportunity, male models will compete to wear original designs which will feature alongside female collections of Haute Couture and Pret-A-Porter dresses from across the globe. The J Male Model Search is open worldwide from 8 to 17 February 2014. Three lucky men will win a chance of a lifetime to grace the 128 metre sky high catwalk in the most iconic fashion show on earth. “We are very excited to discover new faces for the grand catwalk. Male models will definitely bring more energy and diversity to the show” said international model and entrepreneur Jessica Minh Anh. Jessica’s previous female-only catwalks were hosted at some of the most extraordinary venues in the world including London’s Tower bridge, PETRONAS Twin Towers’ Skybridge, Seine River in Paris, Costa Atlantica in Dubai, and most recently the Grand Canyon Skywalk in the US. The winners of the search will wear original creations by London-based designer Mark Marengo, who is known to add a contemporary twist to classic style. In addition, Lebanese celebrity designer Ziad Nakad will return to Jessica’s phenomenal catwalk to premier his latest Haute Couture collection. The master of shapes, texture and colours is expected to dazzle the finale with an almost unattainable balance between elegance and boldness in his every design. The winners of the J Male Model Search will be given cutting edge hairstyles by Singapore's No 1 Action Salon who will also design exclusive architectural hairpieces for the female models to compliment Jessica Minh Anh’s extraordinary vision for the show. Japanese cosmetics brand Shu Uemura will add perfect contouring and colouring to the flawless catwalk looks. The models will be walking in front of exclusive guests, which include country ambassadors, ministers, international designers, company directors and the national and international press. The guests will enjoy a complete VIP experience starting with a red carpet entrance and SoloStep photo booth. Guests will then be seated at the Supertree Grove to enjoy a panoramic view of the entire catwalk on the OCBC Skyway before indulging themselves in artistically designed and freshly made cakes by Singapore’s very own bakery The Patissier at the networking session. At the same time, the press conference will be held at Gardens by the Bay’s spectacular Waterview Room with an expansive view of Marina Bay waterfront. To ensure seamless installation, Jessica Minh Anh has joined forces with Singapore’s major production company Electronics & Engineering for a high tech sound system, and logistics company Nanyang Inc who will create a highly secure backstage area on the OCBC Skyway as well as the special seating arrangement for guests. Other local partners of the show include SGBanner and InsiderTV Asia besides many others. The exquisite showcase in the morning will be extended till the evening with the J Spring After Party in the Pan Pacific Orchard Hotel. VIPs will have a chance to see the most unique pieces from the catwalk up close via a mini fashion exhibition. The winners of J Male Model Search will join exclusive VIPs and enjoy networking in style. Jessica Minh Anh's previous shows have wowed guests with a beautifully made cake dress to a spectacular dove presentation, with the addition of male models already announced, one can only expect some pleasant surprises at J Spring Fashion Show on Gardens by the Bay’s OCBC Skyway. For the latest updates, visit www.jmodelmanagement.co.uk and www.facebook.com/jmodelmanagement. QUEZON CITY – SELDA (Samahan ng Ex-Detainees Laban sa Detensyon at Aresto) reiterated its demand to reinstate the 2,013 names of delisted Martial Law victims who should receive reparation in any of the settlement agreements. SELDA hit the continuous non-implementation of the Human Rights Victims Reparation and Recognition Act. It has been almost a year since Pres. Aquino signed the law, but until now, no claims board has been formed. The claims board is the body responsible for the process of recognition and reparation of the 9,539 victims and others who were not part of the Hawaii class suit. TACLOBAN CITY – "With no sense of urgency to respond to 'Yolanda' survivors' demands, this government is victimizing us ['Yolanda' victims] all over again," said Dr. Efleda Bautista, a storm survivor herself and current Executive Vice Chairperson of People Surge. Exactly last week, not less than 12,000 strong 'Yolanda' survivors thronged to the regional capital of Tacloban in a protest march led by People Surge, an alliance of 'Yolanda' victims and their supporters. This is, so far, the biggest protest action witnessed in Eastern Visayas for more than a decade; also one of the biggest protest actions in the country directed against the Aquino administration. 'Yolanda' survivors under the banner of People Surge laid out specific demands such as provision and sustenance of food aid, until necessary, to aid full recovery while source of livelihood does not stabilize. They presented an 18-point demand that includes immediate provision of P40,000 cash relief for every family devastated by 'Yolanda' and the scrap of the 'no-build zone' policy which is reportedly being implemented not actually for safety of residents but to facilitate entry of big businesses. Other components fall under strategic proposals for full rehabilitation and reconstruction of devastated communities. In the same event, survivors and supporters articulated their call for justice to all victims of Aquino's criminal negligence as well as for their right to housing and livelihood amid the context of a "profit-driven" rehabilitation framework labeled as 'Build Back Better' or the Reconstruction Assistance on Yolanda (RAY). Sister Edita Eslopor, a Benedictine nun and Chairperson of People Surge, insisted that the Aquino government must have consulted the victims at the onset of any rehab effort. She said that "at the rate by which government implements policies like the 'no-build zone', not going through any real consultation among major stakeholders who are the victims, Aquino's rehab plan is going somewhere else, certainly not towards genuine recovery of typhoon victims." The alliance said in their unity statement that the victims should be at the core of all rehab programs, not big business or real estate developers. But Presidential Spokesperson Edwin Lacierda spoke on Wednesday and belittled the series of protests as mere "concerted effort of a few to convince the public that most of our countrymen are dissatisfied." He believes in the 'very good' rating of the President. He is convinced that 'Yolanda' survivors are happy towards the President's rehab efforts. However, Bautista of People Surge lambasted Lacierda's statement saying, "The Aquino administration is pathetic for being a die-hard defender of a bogus survey even after survivors from Eastern Visayas - the worst hit region by the typhoon - have spoken of their real condition." In the same light, just a day after the massive mobilization last week, so-called rehab czar Panfilo Lacson announced an end to the ongoing construction of bunkhouses for use as temporary shelters of displaced families. The construction of bunkhouses is tainted with issues of corruption and overpricing. Lacson denied it but admitted that the bunkhouses are indeed substandard. Earlier, the Tacloban-based Alliance of Typhoon Yolanda victims (ABBAT) set a deadline on the Aquino government to grant their petition for P40,000 cash relief and scrap of 'no-build zone' policy on or before February 14. Conversely, ABBAT community leader Patrick Escalona rejected Lacson's option to provide construction materials instead in lieu of the 40,000 cash relief originally meant for daily subsistence of every family. He said the amount is too small to replace the rehabilitation program of the government. When asked to comment about Aquino's seeming 'lack sensitivity' to 'Yolanda' survivors' concerns, Bautista pointed out Aquino's stand on corruption: "if big bureaucrats ask, Aquino is quick to give hefty amount of cash or bonuses. The travesty is, when victims protested last week to demand immediate government aid, suddenly they claim there is no fund. Who are they fooling? Who forgets the 1.1 trillion-peso pork barrel of the President? Where is the foreign aid going? This government is heartless. Its greed and corruption kill people." Last week, People Surge warned of a continuing protest or 'people surges' in other cities of the country. MANILA – The Home Development Mutual Fund (HDMF or Pag-IBIG Fund) has released P5.8 million in calamity loans for members in Mindanao affected by Tropical Depression Agaton, Vice President Jejomar C. Binay said today. "As of January 28, we have already processed 598 calamity loan applications out of the 827 we have received in four Pag-IBIG branches amounting to P5.8 million," Binay said. Binay said Pag-IBIG Fund has processed the calamity loan applications of 247 members from Butuan, 317 in Iligan, 32 in Zamboanga, and two in Cagayan de Oro. The Vice President, who chairs the Pag-IBIG Board of Trustees, said Pag-IBIG Fund branches in affected areas continue to receive and process calamity loan applications. "We have also issued a three-month moratorium on housing loan payments for those affected by Agaton," Binay added. Pag-IBIG also recently issued a six-month moratorium for housing and short term loans of members living in Yolanda-affected areas. Data from the National Disaster Risk Reduction and Management Council shows the death count from the first tropical depression at 70 as of Thursday, with another 86 injured and nine people still missing. As of Thursday, Agaton has also caused a total of P527,208,104.72 worth of damage, with P273,623,750.00 from infrastructure and P253,584,354.72 from the agriculture sector. Agaton brought heavy rains over Mindanao and parts of the Visayas, affecting some 250,000 families in 16 provinces in Regions 10, 11 and 12, Caraga Region and the Autonomous Region in Muslim Mindanao. PASAY CITY – "Kapag may kasalanan, ikulong. Walang sasantuhin dito, administrasyon man o oposisyon, lahat ng ahensya ng gobyerno." "I believe in the sincerity of the President for the complete cleansing [of government] and going after all those who committed graft and corruption. It’s time for action. Tama na ang salita at investigations. Kasuhan na at ipakulong ang mga may sala," he said. QUEZON CITY – The Trade Union Congress of the Philippines (TUCP) is in favor of a bill in the House of Representatives that seeks to increase the compensation rate of night shift differential in the country from the current 10% to 15%. The bill also tries to change the night shift differential time window from between 10p.m. and 6a.m. to between 8p.m. and 4a.m. “We are in favor of increasing night shift differentials of workers by 5% because it will somehow help night shift workers manage with medical expenses out of sickness arising from their stressful and not so ordinary work schedule,” said Gerard Seno, executive vice president of the Associated Labor Unions-TUCP. House Bill 656 introduced by Rep. Ma. Victoria Sy-Alvarado is an act providing for an increase in rate and changing of the time window of the night shift differential otherwise known as “Night Workers’ Additional Compensation Act of 2013. The code, created in May 1974, stipulates the night shift differential window between 10p.m. and 6a.m. to be paid with not less than 10% of regular wage. The proposed measure also requires the Department of Labor and Employment (DOLE) to draft rules on giving exemptions to company or employers who might be unable to afford the increase.